injury prevention | You Can Get Fit! Recently, I’ve been clearing my house of unnecessaries, including those older issues of health and fitness magazines that have been tucked behind the jar of pickles in the fridge. I’ve been giving them a quick read before donation and/or recycling, and I’ve found a few great tidbits to pass along! Apparently, consuming tomatoes and tomato products slightly increases our skin’s UV protection. We still need to lather up with regular sunscreen, but there’s another reason to chow down on heart-healthy lycopene-containing goods! Bring on the bruschetta! This one’s pretty cool. Have you struggled to remember how many of a certain variety of nuts counts as one ounce? (Either that, or carry around a portable food scale all day long!) Fret no more! I read in Shape magazine that if you spread a single layer of most nut varieties on a 3 inch x 3 inch post-it, you have your one-oz serving. Cool, eh? So, you, as readers, benefited while my house benefited from a cleaning! Have you seen any useful tips from magazines recently? Happy Mother’s Day! 🙂 Be sure to give your mom, as well as your kids, a big hug. Where would we be without our feet? Well… probably sitting a lot. Lame jokes aside, our feet are extremely important, not only for walking and standing, but they’re the foundation for our whole body. Have you ever noticed that if one side of your foot hurts – if it’s bruised, or broken – you put your weight on the other side when you step? This causes a whole cascade of effects all the way up your body. If you weight your foot unevenly for too long, your knee joint and hip joint will also wear unevenly, damaging the cartilage. You may also throw your low back our of alignment. Clearly, it is important to take care of our feet! There are actually many strengthening and stretching self-care exercises that can be done at home to take care of our feet. Today, I’ll talk about two of them. Over time, if you aren’t careful, gravity may start to collapse your arch down. Rather than relying 100% on shoe inserts to prop your foot into its normal position (note that some of us, born with “funky feet”, will always need a little help), why not try strengthening the arch as best as we can? You will need bare feet and maybe a handtowel, if you want the tactile sensation of something scrunching up under your toes. Sit upright in a chair with the towel under one of your feet. Your working foot will make a doming, or inchworming, motion: curl your toes under as your knuckles point more toward the ceiling, creating room under your arch. 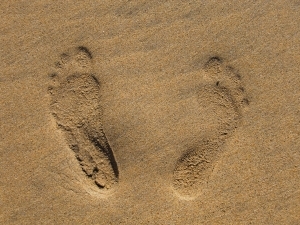 You will create space under your foot, and your heel will drag forward. When you’ve scrunched all the way forward, release your toes, set them back down flat (now farther forward), ,and repeat the process, inchworming your foot forward again. Repeat 3-4 times, or until your foot and leg can’t physically go any farther forward. Repeat the entire process on the other foot. ***If your foot starts to cramp, do take a break! Don’t push through this! And it’s OK to pause, cross the working foot/ankle over the opposite knee, and massage the bottom of your foot with your thumbs to work out any cramps before trying again. 2. Foot and Toe Mobility/Agility. You might not realize the importance of all five of your toes, but pressure from each one of them is key to maintaining our balance. The following exercise will help strengthen your toes and the muscles in your forefoot that help control the movement of your toes. You will need a short cup and several (20 or so) coins of various sizes. Sit in a chair, and set the empty cup on the floor with the coins on the floor surrounding the cup. Using one foot, pick up the coins and drop them into the cup. To really challenge your control, try going for one coin at a time, and perhaps try using more the outside of your foot than the inside for some of the coins. When you’ve gone through all 20 coins once or twice with one foot, do the same on the other foot. Again, if you can, try to focus not only on your first and second toes, which are most likely your strongest toes, but also on your third, fourth, and fifth toes, which are also key in our walking and balance. Work through these exercises a few times a week. You may find that your calf muscles fatigue–they’re working hard, as well, during these moves, so give them a little extra stretching love. If you routinely do these exercises, with any luck, you can minimize or avoid plantar fasciiitis and other nasty foot maladies! Try them out, and let me know what you think! Do you do the same exercise day-in, day-out? Don’t get cross, cross-train! Doing different forms of exercise is good for the brain and the body. We get in ruts, right? Get out of bed, put on running clothes, go for morning run. What if you joined a gym at one point and did something different, say, went to a group cycling class? Or lifted weights? Uh oh. I can smell your fear from this far away! You’re getting uncomfortable. That’s what happens—we get happy with our routines. But sometimes, it serves us well to break away. If you’re a frequent walker, you’re constantly working the muscles in the front-to-back plane of the body. Taking, say, an aerobics class would get your body moving laterally, developing strength in new muscles. So, participating in a completely different fitness activity is great for your body, because it will strengthen your body in new places. It may also get you thinking in new ways. I find that when I try a new activity, it gets my brain’s creative juices flowing. Besides, it’s just plain fun to do something different! What’s your favorite way to cross-train? It’s the end of the day. Where are your shoulders? Are they droopy and rounded forward? If they are, does your posture make your back and neck ache? So, how do we stand up straight? Let’s start by floating the crown of your head toward the ceiling, trying not to let your chin jut forward or tuck backward too much. Your shoulders should relax away from your ears. Whether you are sitting or standing, your pelvis should be in a neutral position—that is, your hip bones and your pubic bone should line up in the same vertical plane. Hopefully when this happens, your tailbone is neither sticking out too far behind you (like Donald Duck) nor tucked under you too far. There is some natural curvature to your spine, so we aren’t aiming to entirely flatten it out, but try to deemphasize the rounded shoulders that plague many of us by the end of the day. If you spend a lot of time in an uncomfortable chair, sometimes placing a small cushion in the curve of your lower back can help with support, and can actually help you sit taller. Keep the cushion small, though. Oftentimes, just a small washcloth folded up can do the trick! So, try it out, maybe only a few hours a day to get used to the great posture that you’ve been neglecting for years. I promise you that over time, runway model perfect posture will come naturally! Whenever I practice yoga in a room with mirrors, I plop my mat down as close as I can to the mirror. Lest you, or the others in the class, believe I have vanity issues (ok, I have been known to tuck a stray hair back into place), I’m mostly concerned about my body alignment. Proper body alignment during a workout will help prevent injury, and it also helps you get the most out of every second of your exercise session. No wasted time! You’ve heard for years to keep your knees behind your toes when you do a squat, right? Like you’re sitting in a chair, but someone took the chair away from you at the last minute? In your mind’s eye, you think you’re doing a proper squat, but how do you really know, unless you see yourself in a mirror? At first, it’s weird to spend your entire workout staring at yourself, I know. I still get freaked out by it, and I teach entire classes facing a mirror, some days. So, work yourself into the idea by having the mirror at your side. Just don’t crane your neck sideways and give yourself a neck cramp, ok? Take a peek every now and then. And you know what? You’ll find that after a few months of checking your form in the mirror, your body will automatically know where to go. You won’t have to look in the mirror so often anymore! Progress! Your body and mind getting stronger together!